HOME REGISTER EVENT ROUTES PURPOSE PHOTOS/COMMENTS REGISTRATION COMING SOON! 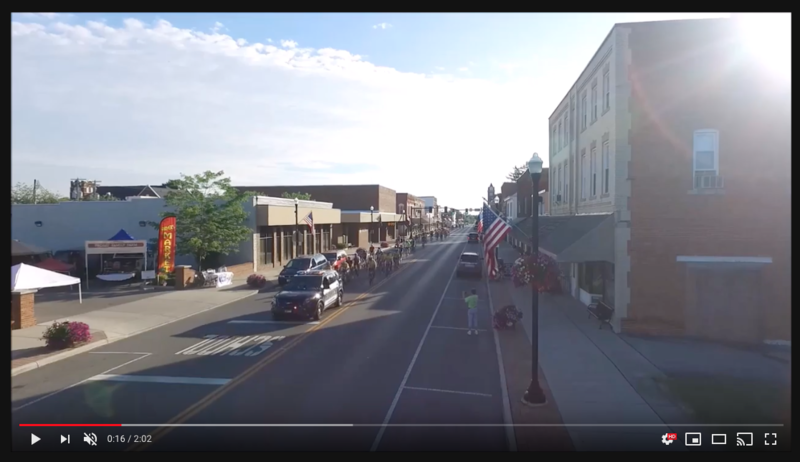 The 2019 Bluffton Ride to Remember (#BR2R19)--our 5th annual event--takes cyclists through the Village of Bluffton, Ohio and the surrounding countryside. There are 4 loops where you can choose your distance from as few as 2 miles or as many as 112! The Village of Bluffton is located on I- 75 in northwest Ohio (exits 140 and 142). The area features flat, well-paved roads through farmland and past areas of historical interest and natural beauty. Hello, past & future riders! Stay up to date with Ride options, updates, and post-event photos by email and though Facebook! Waiver signature required at sign-in. Parent must sign for minors & accompany minors <15 years old. CPSC bicycle helmet is required! HOME REGISTER EVENT ROUTES PURPOSE PHOTOS/COMMENTS SEE YOU IN JULY! REGISTRATION: Stay tuned, we'll let you know when online registration goes LIVE! 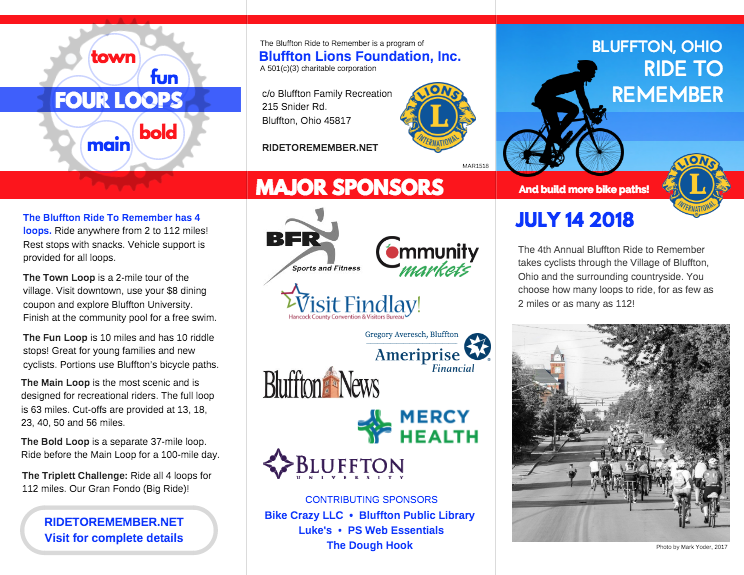 ​The Bluffton Ride to Remember is a program of the Bluffton Lions Foundation, Inc. A 501(c)(3) charitable corporation. ​All proceeds go to the Bluffton Lions Foundation Bike and Pedestrian Pathway. Within Bluffton, 4 miles of pathway and the Lions Trailhead Park have been funded. Another 6 miles are in the pathway master plan. ​The Ride was created in memory of Ropp & Mary Emma Triplett who helped launch Bluffton's first pedestrian and bicycle path​.